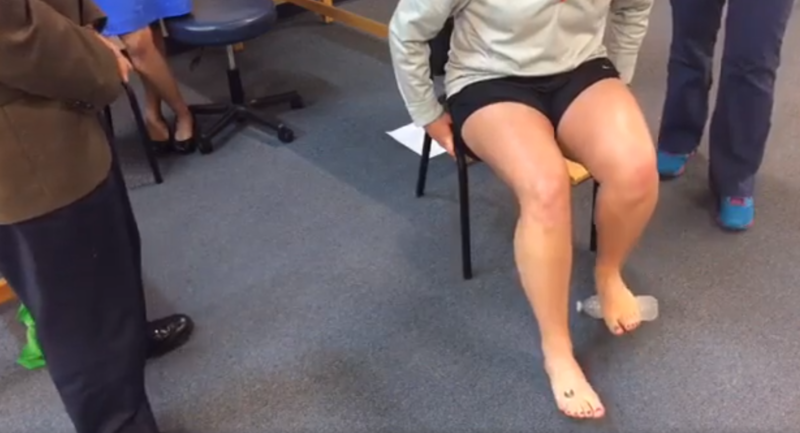 Jed Mescon recently sat down with the team at UT Erlanger Orthopaedic Walk-in Clinic to talk about the two most common sports-related injuries: plantar fasciitis and shin splits. Physical therapist Shawn Craig is a huge proponent of exercises and believes they are crucial to recovery. Luckily these exercises can all be easily done at home, using household objects or the provided Theraband, all in a couple minutes while watching TV or standing in the kitchen. Plantar fasciitis is one of the more common causes of heel pain. It is caused by an injury in plantar fascia, which is the tissue under the foot and connects a muscle from the back of the calf to the big toe. Pain is often worse in the morning, and might feel like walking on hot coals. Recommended treatments might include ultrasound or cold treatments to reduce pain, but patients are able to promote their own recovery through a variety of easy exercises at home. In the clinic, Craig provides each patient with a hand-out of recommended exercises and guides patients through each of the recommended exercises right there in the clinic to make sure they can do them accurately later at home. With a Theraband, Craig will tie a small loop to fit over the injured foot. The Theraband is placed in the arch of the foot, creating tension while performing exercises in four different directions: forward, sideways left and right, and back. These exercises will help to strengthen all the muscles surrounding the foot. When pointing your toe forward, Craigs says to push as if you are pumping the brakes in a car. To create tension while pulling your toes towards you, tie the other end of the band around a table leg or something else steady that won’t fall over. Do about 12 repetitions in each direction. One good stretch for plantar fasciitis uses a slant board at the clinic, but you can easily use the curb or any other slanted object to perform a good stretch, leaning forward slightly while your foot is raised at whatever level feels like a good stretch without being too uncomfortable. For an at-home solution to reduce inflammation and help with pain, a simple water bottle can do the trick. Simply freeze the water bottle, then sit down while watching TV or Facebook live and roll the water bottle back and forth on the floor with your bare foot. While a tennis ball can also be used to help roll out the tissue, the coldness of the frozen water bottle offers the benefits of reducing inflammation. Shin splints are a pain at the front of the lower leg that is usually experienced by runners who go “too hard, too soon.” Shin splints can sometimes be prevented by having proper footwear that supports the arch. The walk-in clinic can help patients obtain a prescription for the correct arch support, and also offer heel cups for shoes. Place marbles or cotton balls on the floor. Pick each one up individually from the floor with the toes of your injured foot, and pass them to your opposite hand. Place a small towel flat on the floor. Squeeze the towel with your toes and try to raise the towel by just an inch or two. This exercise is harder on carpet, so use a smooth floor if possible. The UT Erlanger Gunbarrel Walk-in Clinic offers fast, convenient orthopaedic care when you need it most. Receive expert treatment for those unexpected aches, breaks, strains, and sprains. Learn more here or call 423-893-9020. Physical therapy: What is it good for?